Expanded functionality will help digital agency partners build custom solutions for nonprofits on the Salsa Engage fundraising, advocacy, and marketing platform. 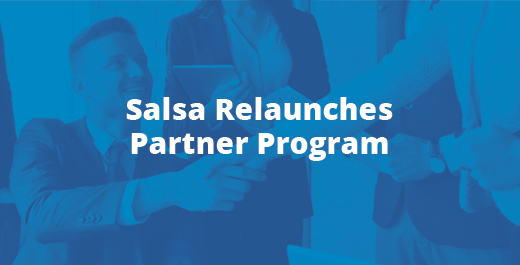 Bethesda, MD — November 30, 2017 — Nonprofit software leader Salsa Labs (Salsa) announced today that it is relaunching the Salsa Partner Program and expanding functionality in Salsa Engage that will help digital agency partners better serve their nonprofit clients. By expanding the Engage API set, enhancing the use of parameters, introducing content syndication and building integrations with external marketing platforms such as Facebook Ads, digital agencies can now use Salsa Engage to serve nonprofits with the unique solutions that they need to effectively manage their organization and deliver on their mission. Interested companies can reach out to Blake at partners@salsalabs.com. Salsa is a technology company that provides powerful fundraising, advocacy, marketing, and CRM software to nonprofit organizations helping them Engage and Change the World. Leveraging Salsa’s suite of easy-to-use tools, nonprofit customers of all types and sizes can truly communicate and manage relationships with their constituents across any channel including email, social, mobile, direct mail, and face-to-face. Through the Salsa Scholars eLearning experience, users have access to strategic best practices and training that helps them maximize the tools and exceed their organizational goals. The company fuels more than 3,000 organizations and 10,000 nonprofit professionals to deliver on their mission! For more information visit http://www.salsalabs.com.